I'm in a transition and want to get into being a driver. I use to work for a few Truck Leasing companies 20+ years back and always found trucks cool! Back then I should of got my license but never did. In my last employment of 16 years I have driven over 1.2 million safe and accident free miles in a few of my personal vehicles. Backing exams are the most humbling experience I’ve had in a long time!! I took my CDL on March 7th in Springfield I am with Wil-Trans and only missed two items on the Pre-Trip and moved onto the backing and my straight line was perfect my offset to the left was perfect and I had to do the drivers side parallel and got a little messed up ran over a cone and she blew her whistle and looked out and said I'm sorry I killed your cone and she laughed. I pulled up and repositioned and backed in with one GOAL and got in straight. I knew I passed when she removed the cones infront of me so we could go on the road test. So I was a happy man. We took off and I only got dinged with two errors not turning on my turn signal as I was making the hard right turn where the curb on the right sticks out and when I realized it was was a in the lane of the street and said **** and turned it on and she said Nice Try and laughed! How stupid of me lol. When we got back she got out of the tractor and said you passed and told her thank you! She said Curt you did it not me and you should be very proud and I said I am for passing on the first time. I called the office and said come get me but one of the trainers saw me during the road test and he said you passed I said YES I did he could hear the BIG smile over the phone. It was a great day for me and have been racking up the miles with my trainer. One bit of advice I found when I thought about if you stall you fail so what I would do is adjust my steering wheel to where my left knee would hit on the back of the steering wheel so you could only let the clutch out so far without a problem of stalling and I would also always start in 3rd gear! My backing still needs work but it's slowly getting better but always trying to improve. Everyone says it will improve over time just to never rush anything. Keep on rolling and relax. My instructors at Wil-Trans have been amazing and can't say enough good things about Wil-Trans' training program. You need to study and study for your exam and your Pre-Trip because it is on you! If you are prepared you will pass with flying colors and if you don't study and prepare you will struggle and most likely fail. Its all in how much you want it and let me tell you I wanted it BAD! It's day two of class and just took my exams and passed with flying colors. I received 95% (2 wrong) on General Knowledge and 100% on Combination and 100% on Air Brakes. It took a lot of studying and hard work to get this far. About the Wil-Trans training it has been great so far and everyone is so welcoming and nd my recruiter Alondra has been great. I met her yesterday and gave her a big hug. If anyone has questions about Wil-Trans call her and she will shoot straight. We have 3 total in the class and loving that the size is small. More one on one time and lots of questions answered and will to make sure you know your comfortable. 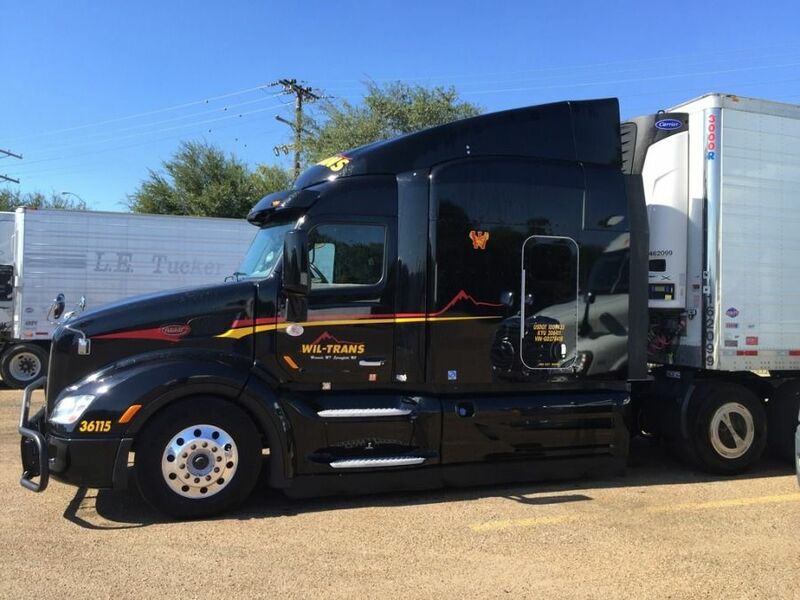 I am excited about what is to come next in this journey and glad to be part of the Wil-Trans family! More to follow as I keep going driving forward. I am going to school on Feb 12th for Wil-Trans in Springfield MO and they send me the General Questions, Combination and Air Brake questions plus they suggested the phone app DMV Genie and you pick the state of where you will take the CDL exam and it is pretty much the same questions as what they sent me. Also, I have studied from TT and it has given me lots of information of general knowledge. I can go through the questions and either get a perfect score or a few wrong because I read the question wrong and me being stupid, lol. Check it out and let us know and good luck and good luck to me. My 2 cents worth, I am going to school at Wil-Trans Feb 12th and I picked them for their size and small family approach the people have been amazing so far and make you feel part of the family. I had a tour of the Pet plant seeing one of my customers tractors being made, what a cool deal. I guess as a driver is like being a airplane pilot is you are in control and have to make that decision to back away from the jet way or say it is not a go because of safety or bad weather! I live in Texas and was not in the Ice but knowing how people drive they forget that on ice and in bad weather its best to park and wait it out till its safe to proceed and as you saw in Houston it will get people killed for no reason except being stupid and not staying parked. I guess if your dispatcher has a issue with you not driving in ICE or conditions that are dangerous then they are not looking out for you or the public. Well I am 56 and starting over again and making this my final career and I start my training at Wil-Trans on Feb. 12. Im excited and nervous all at the same time but I am use to being out on the highways I have in the past 16+ years driven well over a Million miles accident and ticket free. So age is just a number! Well my last gig with 3 different companies I was in the wholesale used textbook buying and selling business! In the 16+ years I have driven well over 1,000,000 miles on a few vehicles and all accident and ticket free. I am not in a hurry to get someplace because I know I will get there when I get there safe. I am now only two weeks away from starting my New Career at Wil-Trans in Springfield, MO on Feb. 12, 2018 as a rookie and I am so excited and nervous at the same time. I have studied and taken the practice test on the DMV Genie app and pass them all and the ones I get wrong are usually stupid reading errors and some of the brake questions. Usually I only get 2-5 wrong on them and sometimes 100% right. Everyone at Wil-Trans has been amazing and my recruiter Alondra checks on me every week to see how I am doing and I think that is so nice. The whole interview process has been great and it can't get here soon enough. I know there is so much to learn as talking to my brother last night he has driven and been a driver trainer for Rhoel and put on over a million safe miles and he just told me ask questions of your trainer no matter how stupid they may sound and said you will screw up but just learn from the errors. Practice makes perfect, right? So anyways, Wil-Trans is the only company I applied at and like that they are smaller and have small classes for that one on one training. Wish me luck and I will keep you all updated. Hello all! Hope everyone had a very merry Christmas. My Solo time is wrapping up. I will be back in Springfield over the weekend and will start the "on boarding" upgrade training next Tuesday. Solo time has flown by. I've put lil over 4500 miles on this Freightliner since I recovered it in PA back on the 14th. I feel good about everything EXCEPT my backing skills. They are horrible. I know they will improve with time & experience. In the meantime, G.O.A.L is my BFF and I use it frequently. I'm surprised none of my backing fiascos have made it to YouTube or one of the "Shame" FB pages lol. While back in SpringMO I am going to spend a lot of my down time on the practice pad backing, backing, backing and then I'm going to back some more. I am also getting assigned an amazing Truck. It's my first trainers truck, the very first truck I drove on the road. My 1st trainer resigned and I requested the truck. Low and behold, Wil-Trans became my Santa and approved it. I'm super excited to be getting such a nice truck as a rookie. Hope everyone has a very Happy New Year!!! 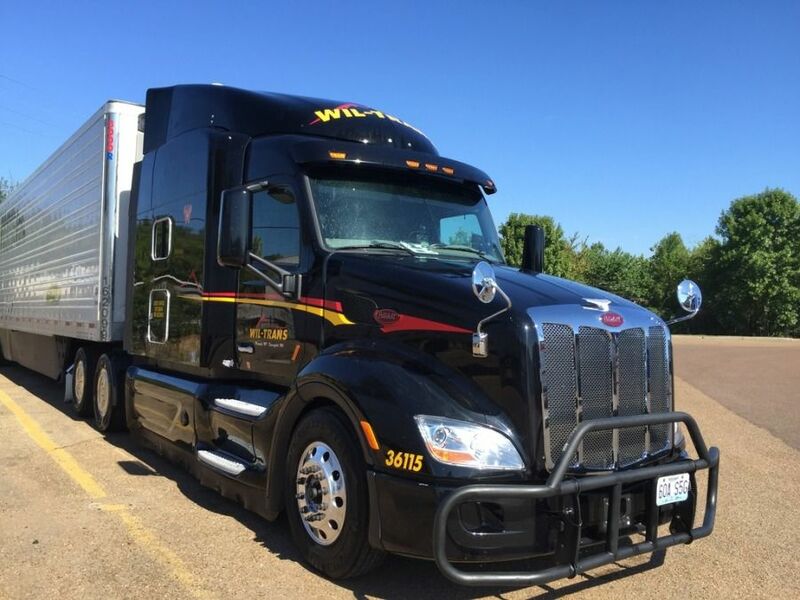 Well I am totally new to this but with some background in the truck leasing business over 20+ years ago and Wil-trans was the only company I sent a application to just because I have driven by their terminal many times in Springfield, MO and was always impressed with their equipment! I have gone through the interviews and my recruiter Alondra has been amazing along with everyone else there and I am in and my first day will be February 12th, 2018! I have been studying hard and been passing the pretests and so excited to join their family. They have been impressed with all my phone interviews and have told me I will be a perfect fit for the Wil-Trans family what a wahy to make you feel so welcome! I am going in wide eyed and going to be a sponge and they want people with no experience so they can educate the way they want and no bad habits. I know I will make mistakes and like my older brother who use to be a driver trainer for Rohel with over a million miles he told me you will mess up but just take it in stride and listen to the trainers! I also like the fact they only have a few students in each class verses hundreds like other companies and I am more the type I need one on one training and love the fact they are a smaller company and that is what I wanted so I really picked the right company and I plan on giving them the rest of my career since I am 56 yo and tired of working for companies that can just say your gone and yes I know they can also but in my previous jobs in sales in over 16+ years I have driven over a Million safe and accident free miles so this will be right up my alley. I live outside San Antonio and can't wait to start. Alondra has checked on me every few days and we have hit it off along with Casey and Lisa Wilson called my wife to finalize all the hiring process since I still have 2 kids at home and to make sure this will be a good fit and that went great on that call. My name is Curt or Curtis when my mom was mad at me and I told them this and they all laughed and said they will call me just Curt! I am starting with Wil-Trans whos owns Jim Palmer and I start 2-12-18 in Springfield, MO and it has been a great process from the first phone call with Alondra! I am new to this but was in the truck leasing industry over 20+ years back and taught myself to drive but I am going in with eyes wide open as I know nothing. I have been studying for my CDL exam and all my practice tests I have taken Ive passed. I am so excited to begin this new career. My brother use to drive for Rohel and he drove for over a Million miles and was a driver trainer for them and told me expect to do everything wrong but it will all come to ya just listen and learn. Filled out the application with Wil-Trans pretty easy. Just talked to a nice lady at Wil-Trans and they seem like a real down to earth company and small with great equipment! I also asked about their drug testing and its just a UA no hair folical. She is sending me information and the funny thing we both grew up in Wisconsin and only about 60 miles apart so cool and a small world.